The Breakers hotel located in West Palm Beach plays host one day a year to the premiere Ferrari Concours in the United States. Some of the oldest, newest, greatest, and rarest Ferrari's are parked on the beautifully manicured golf course lawn. The cars roaring engines trumpet their arrival as they are arranged on the lawn throughout the early part of the morning. The occasional police siren is an indication of an overeager Ferrari motorist late for the show. The Cavallino Classic is just one of the events that transpired during the week. Activities begin a few days prior with track days at Moroso Motorsports, including the first round of the Historic Challenge. Other activities include a driving and culinary tour of Palm Beach, a jetport reception, dinners, and an art show. The final event being the concours. The following day, the Ferraris are invited to attend the Palm Beach Concours d'Elegance held only a few short miles away. This year was special; the one that should not have been missed. Located on the Croquet Lawn were the previous winners from the past fifteen years of the Cavallino Classis. At the entrance to the lawn was a 166 Spyder Corsa chassis number 004C, only the second Corsa to be constructed. More importantly, it is believed to be the fourth Ferrari ever created. Out of the eight remaining Spyder Corsas that have survived to this date, chassis numbers 004C and 016I are still clothed in their original bodies. Meaning they have been properly and painstakingly preserved rather then undergoing any restoration. Since it has retained its original chassis and body, many Historians refer to 004C as the oldest complete Ferrari still in existence. Next to the 166 Spyder Corsa was a Ferrari FXX, one of the latest Ferrari models to be produced. The contrast of 'oldest' and 'newest' Ferrari was a testament to the advancements in technology, racing, and automobile construction. The legacy that Enzo Ferrari began in the late 1940's of producing beautiful and powerful race cars is still true and prevalent to this day. Beauty is not in a bucket of paint. It may enhance the vehicles exterior, but true beauty lies in the history and the potential. This was proven to be true by an un-restored 212 Export Fontant Spyder. It looked rather out-of-place compared to the rest of the vehicles on the field. It was the only vehicle of the day shown in true 'barn find' condition. The motor was greasy and placing a hand on it most surly meant a run to the restroom to do some scrubbing. The interior was incomplete with rips and tares everywhere. The body was rusty and looked un-repairable. However, this was one of the most popular vehicles of the day. Even without a restoration it still amplified the beauty and mechanical masterpiece that was, and is, Ferrari. Just by looking at the vehicle, one knew that it had a long and proud history. A restoration will wipe away its battles scares and dents, but its long and documented history will persist forever. The prestige and excellence that was on display of the Croquet Lawn was impressive. Separating the Croquet Lawn and the tenth hole of the Ocean Drive golf course were three Ferrari Enzo's just begging to be driven. Continuing on to the remainder of the field was everything Ferrari, and some of the most beautifully restored and pure examples in existence. Many of the owners stood close by their vehicles, eager to talk about their vehicle and the experiences it has earned them. The judges moved from car to car throughout the morning, inspecting all areas of the car, looking for proper chassis and engine identification, performing tests on the lights, horn, and other components to verify proper running order. Behind many of the vehicles were the original tool kits that came with the car. Judges focused heavily on originality even down to the spare tire. A bonus section housed a competition display consisting of Ferrari cars from Formula 1, GT, and more. 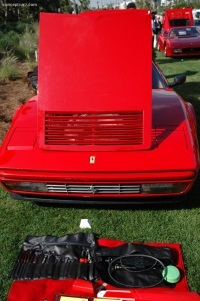 Merchants were on hand, selling Ferrari memorabilia, art, literature, and performance parts. An awards ceremony dinner transpired later that evening at the Breakers. The Ferrari 410S chassis number 0596 CM (Carrera Messicana), also shown at Pebble Beach, was the clear winner for the Competition Class. The body was handled by Scaglietti, a coachbuilder notorious for his lightweight designs and streamlined designs. Only two 410 S work cars were created: chassis number 0596 CM and 0598 CM. The 'S', or 'Sport', cars were factory works cars. 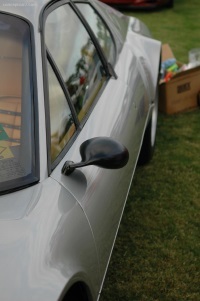 A small number of customer cars were created, their 'S' designation represented 'Speciale'. The international racing career for the works cars was very limited with their only appearance occurring at the 1956 Buenos Aires Grand Prix were both cars retired after suffering mechanical difficulties. Since that time, the cars have been sold to private collectors where they have undergone restorations and been campaigned at vintage racing events and concours's through the United States. The 1956 250 GT TdF with chassis number 0507G was awarded Best of Show for the Road Car class. Even though it was a road going car, it was actively campaigned by its first owner, Ottavio Randaccio of Milan, in many hill climbs and races including the famous Mille Miglia. Since that time it has undergone restorations and resided in private collections and museums. Cavallino is Italian for the Prancing Horse, the venerated symbol of Ferrari. And the word Cavallino, for the true enthusiast, embodies the very essence of Ferrari. The scenery, location, weather, and cars; it will be hard to find a Ferrari event that rivals this years Cavallino Classic. It just doesn't get any better than this.